If you follow me on Instagram or Facebook you might have seen that last week I received a Gousto box which I was very excited about. I’ve known about Gousto for a while and always thought it sounds like a great idea so when the opportunity to try one of their boxes came up I leapt at the chance. Gousto sent me this box to try but this is not a sponsored post and all opinions are my own. 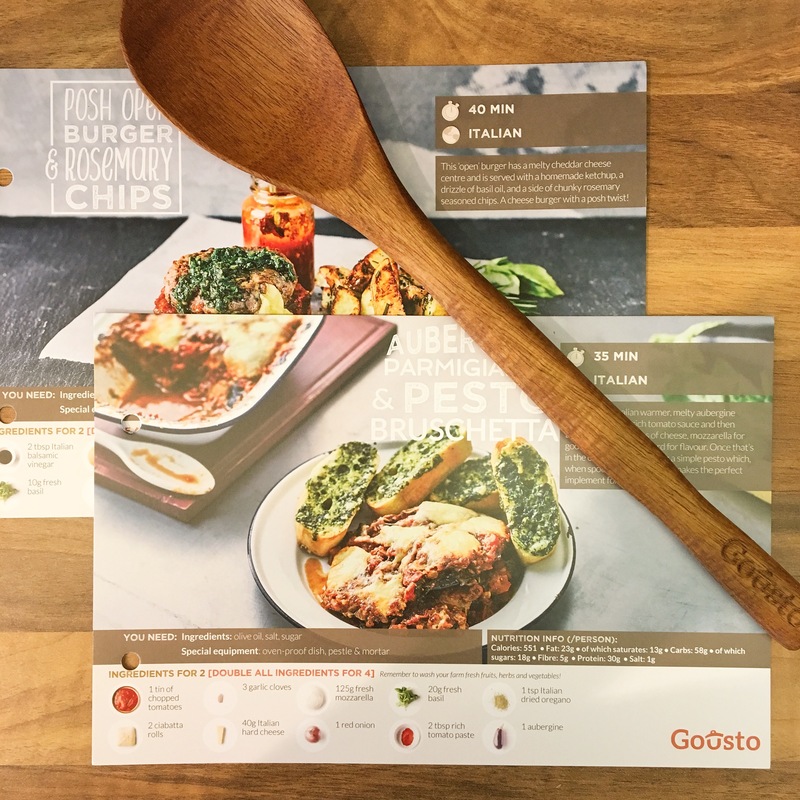 My Gousto box contained two meals that each serve two adults, you get to pick from 22 different recipes each week so there is always something new and exciting to try. I really enjoy cooking but often find myself stuck in a rut cooking the same meals again and again, so the fact that there are always new recipes to choose from really appeals to me. Also the fact that all the ingredients arrive measured out for you mean that there is no food waste and also that it is easy to cook with a high maintenance 11 month old hanging onto your leg. 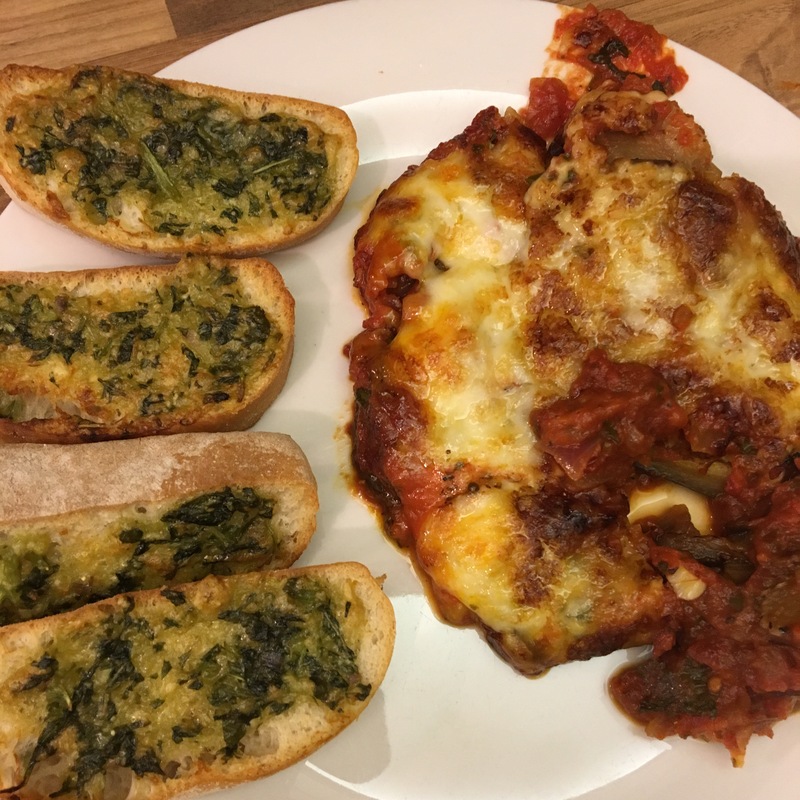 We chose ‘Posh Burgers with Rosemary Chips’ and ‘Aubergine Parmigiana with Pesto Bruschetta’, I eat mainly vegetarian and Dan is a meat lover at heart so this was the best of both worlds for us. 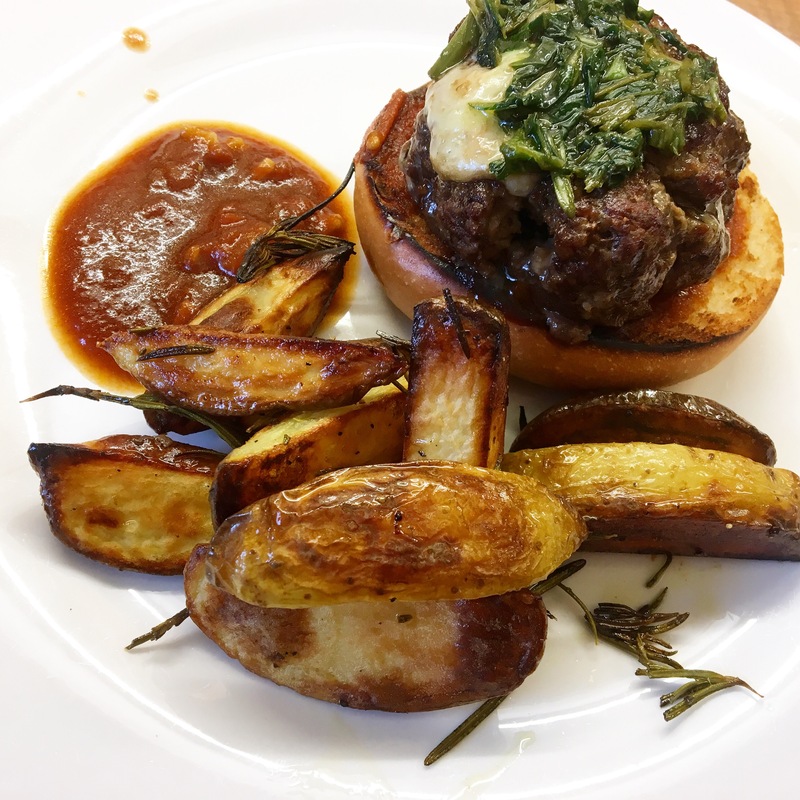 I cooked the burgers on Sunday, the recipe was so easy to follow and only took 40 minutes to do which was accurate to the time written on the recipe. The food was delicious and included a home made ketchup which I will definitely be making regularly. 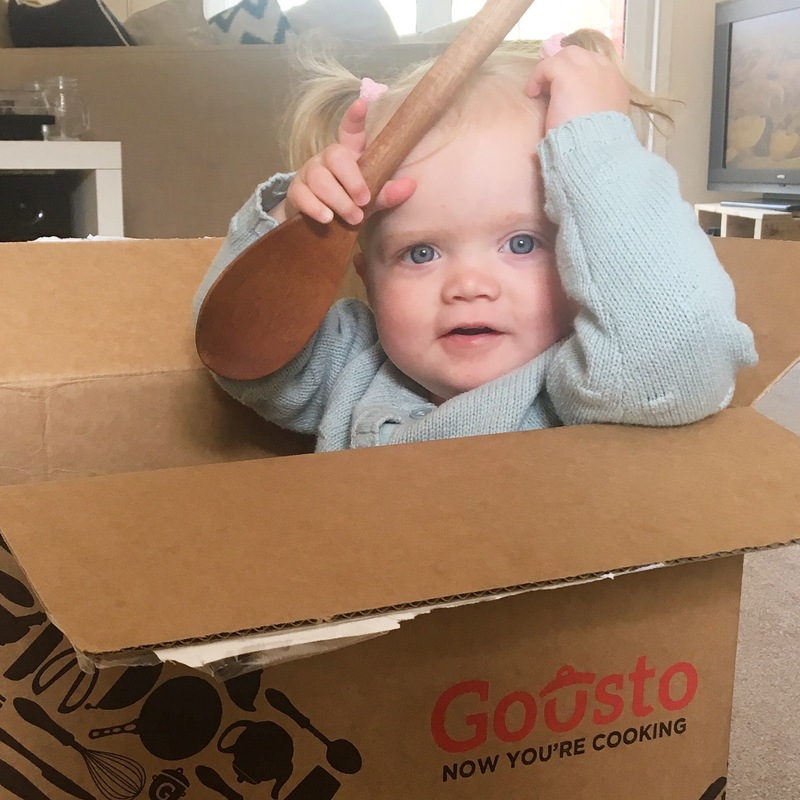 My favourite thing about this Gousto experience happened the next day when I was putting Darcie to bed and Dan decided to make a start on making the Aubergine dish. For anyone who doesn’t know us well, this never happens! I could count on one hand the amount of times Dan has cooked in the last year and still have fingers left over to swear at him with. But the Gousto box really appealed to him, he actually cooked the entire meal and had it waiting on the table with a bottle of champagne by the time I came downstairs. As a result of this miracle he has decided he would like to be more involved with the cooking, and if that’s not a win then I don’t know what is! Darcie clearly thought the food looked and smelt delicious too because she decided to join us for dinner rather than go to sleep, she sat in her sleeping bag, looking up at us with those big beautiful blue eyes pretty much pleading for scraps! If you are interested in trying the Gousto box, I have a discount code for £20 off your first and second boxes, just use TORNADO when checking out. That is actually an incredible deal as they are usually £27.49 so essentially you’ll be getting two meals twice for £7.49! It is a subscription service so just make sure you remember to cancel when you don’t want any more boxes. What’s your favourite dish to cook? I’m always looking for inspiration in the kitchen! I’ve tried the first week and it was amazing! I’m not sure if I would pay that much each week, but with the discounted price it was definitely worth it! I do love the boxes but yes it does add up to a lot of money!